This one-third of an acre garden demonstrates a wide variety of gardening practices, including year-round vegetables, fruit trees, drought tolerant ornamentals, and native plants, as well as container gardening in wine barrels and handicap accessible gardening. Directions: From the main entrance to the hospital, turn left and follow around the complex to the back corner. The garden is near the northeast corner of the building. Visiting hours: The garden is open to the public anytime. UC Master Gardeners will be available to answer questions during our workdays (Mondays 8:30–11:30 a.m.) and during our monthly (except November & December) classes and workshops, weather permitting. 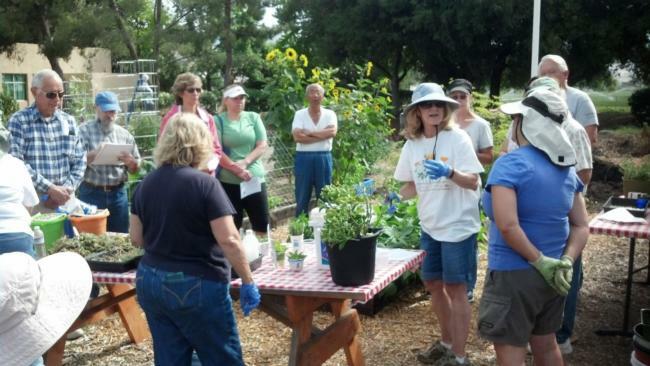 The South County Teaching & Demonstration Garden (SCTDG) is the southern-most UC Master Gardener project in Santa Clara County. It primarily serves the residents of southern San Jose, Morgan Hill, San Martin, and Gilroy. Located on the campus of St. Louise Hospital in Gilroy, it is approximately one-third of an acre. The garden consists of ten raised beds, a number of growing mounds, including one for drought-tolerant ornamentals, a native plant garden area, a handicap gardening area, several wine barrels for container gardening, a 28-tree fruit orchard and an additional espalier area, and composting capability, both standard and worm composting. Additionally, we conduct limited soil and plant trials to determine what grows best in South County, and how best to grow it. We continue to monitor for birds and insects throughout the project. As a teaching and demonstration garden we take our obligation to help educate the public very personally.